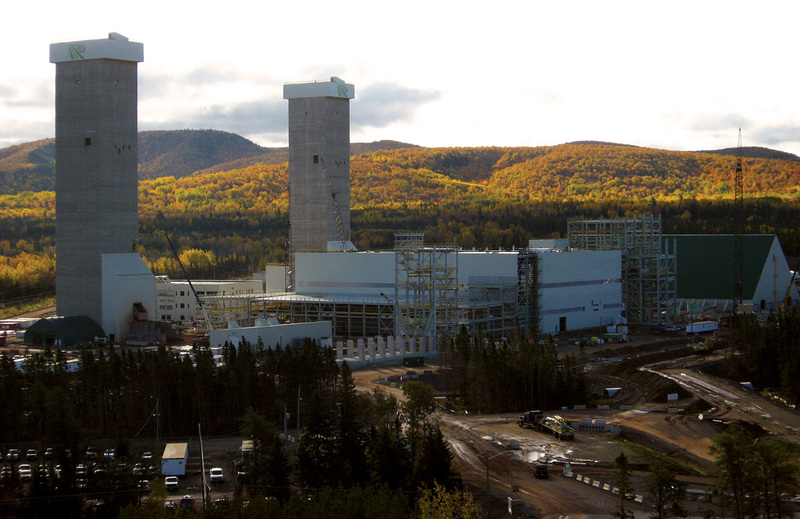 FCC Construction managed the construction for the two new headframes on this $1.7 billion potash mine expansion. 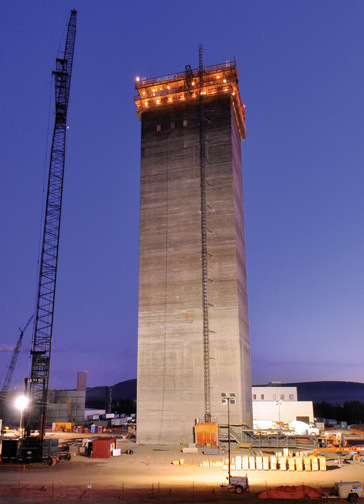 The foundation for the production headframe was done inside a secant pile wall, due to an anticipated inflow of water at a rate of 600 gallons per hour. The wall was constructed of 3’-0” diameter concrete caissons, drilled and socketed into bedrock, and overlapping each other to create a retaining and water cutoff wall. The excavation was then done inside the wall. As the excavation continued down, equipment (including excavators!) had to be lowered into and lifted out by cranes. 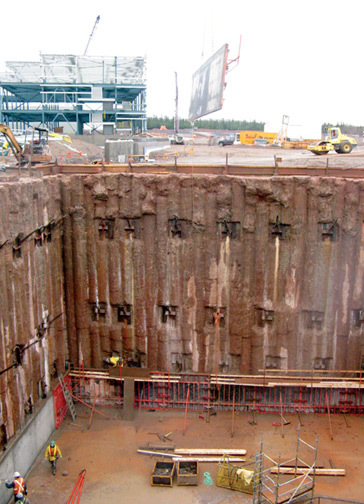 Both head frames have 60 feet deep foundations. The excavations, including both common excavation and rock blasting and removal, required moving in excess of 55,000 cubic yards of material. Both foundations required placement of 10,000+ cubic yards of concrete. All concrete pours were mass concrete pours, the largest at 2100 cubic yards, started at 5am and lasted well into the evening. 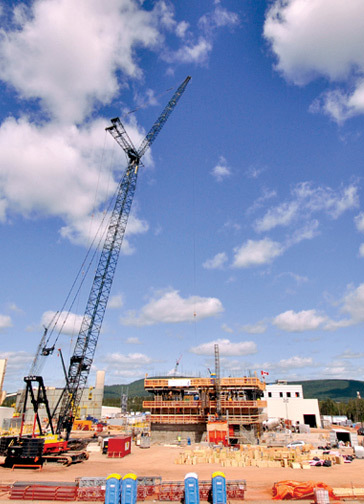 The head frame construction utilized the slipform concrete method. This process consists of placing concrete in a form that is continually rising. The first head frame, at a height of 300 feet, was completed in just 14 days and required approximately 6500 cubic yards of concrete. The work deck, that is part of the rising form, had in excess of 50 men working on it at all times. They continually placed concrete, installed rebar, installed forms for pockets in the walls, finished the walls (inside and outside), checked the levels of the deck, etc. In addition to the main wall, an elevator structure was constructed up the outside of the head frame for access, along with a staged stair tower. 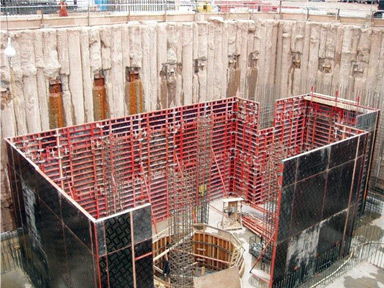 The tower will also encompass steel framed floors (some with concrete decks) and mechanical and electrical services. Project: Construction of two new head frames (Service Shaft and Production Shaft) at Penobsquis Potash Mine owned by Potash Corporation of Saskatchewan (PotashCorp) - the world's largest fertilizer company.